As a leading expert in minimally invasive and regenerative orthopedic techniques, Dr. Steven Meier is frequently called upon to teach physicians around the world. 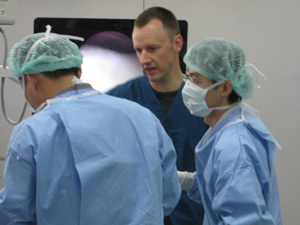 From October 26 to November 1, 2009, Dr. Meier was invited as the featured speaker and guest instructor for a surgical training event held in Bangkok and Pattaya, Thailand. Participant surgeons traveled from Japan, China, Vietnam, and South Korea to attend several days of instructional courses led by Dr. Meier. In recent years, Bangkok has become the epicenter of orthopedic training for practicing surgeons throughout Asia. At Chulalongkorn University, one of Thailand’s oldest academic medical institutions, a massive state-of-the-art training facility complete with cadaver specimens and simulation equipment was constructed to accommodate the growing interest in advanced surgical techniques. In addition to its geographic advantage, local Buddhist customs consider it an honor to donate one’s body to science and the medical community. For this reason, Bangkok has access to an immense supply of cadaveric tissue specimens that are much more difficult to obtain throughout the rest of the world. 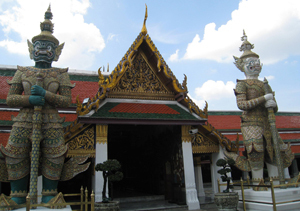 During his first lecture in Thailand, Dr. Meier led the Arthroscopic Knee and Shoulder Surgical Technique Course at the prestigious Chulalongkorn University Hospital. Shoulder topics in this series included new arthroscopic rotator cuff and instability repair techniques. Knee topics included anatomic anterior cruciate ligament (ACL) reconstruction techniques as well as meniscus repair and osteochondral graft transfer methods of cartilage restoration. After wrapping up the training program in Bangkok, Dr. Meier traveled to the city of Pattaya to give several presentations at the Sixth Annual Conference for the International Society for Orthopedic Surgery and Traumatology (SICOT). His first lecture, entitled “Treatment for Multiple Ligament Knee Injury”, covered orthopedic management and reconstruction of knee dislocations, ACL, PCL, MCL, and LCL injuries as well as meniscus and cartilage damage. In a second lecture, Dr. Meier discussed “Double-Row Repair in Rotator Cuff Repair” and participated in a Q&A panel to address the current literature and controversies surrounding rotator cuff repair. Dr. Meier has always enjoyed the challenge and fulfillment of educating and training doctors from around the world. In 2003, he founded Arthroscopy Worldwide, a non-profit organization dedicated to sharing the latest surgical knowledge and technique with medical professionals in developing regions of the world. With an ever-changing group of medical volunteers, Dr. Meier regularly travels to foreign hospitals across South America, Africa, Europe, and Asia to train local surgeons in the most advanced arthroscopic techniques in orthopedic surgery. Through generous donations, the organization helps these hospitals acquire the equipment necessary for advanced arthroscopic procedures and promotes the use of less invasive and more effective surgical care for patients around the world. Contact Steven W. Meier, M.D. Dr. Steven Meier is a board-certified orthopedic surgeon with fellowship training in sports medicine and minimally invasive arthroscopic surgery. As a leading expert in the field of joint preservation and cartilage restoration, Dr. Meier offers a variety of cutting-edge treatments for sports injuries. Find out more by contacting Dr. Meier at 310.736.2793. You may also fill out our online contact form and a representative from Meier Orthopedic Sports Medicine will be in touch with you shortly!